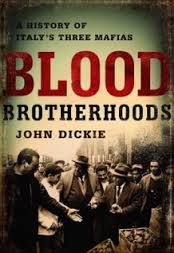 Aram Bakshian offers a good review of John Dickie's Blood Brotherhoods: A History of Italy's Three Mafias for the Washington Times. The resultant bourgeois monarchy, dominated by the cynical, economically powerful northerners, was never fully accepted by millions of impoverished Neapolitan, Calabrian and Sicilian peasants for whom unification meant yet another layer of bureaucracy and taxation — and an alien one at that — on top of everything they had endured under their own Bourbon dynasty. Thus, while Italy emerged from the Risorgimento as a superficially unified, modern state, the unity was more apparent than real, especially in the south. There, in the poorest, most backward parts of the country, and in the absence of a strong sense of nationhood, a parallel power structure — a real sub-rosa state beneath the official, but unreal one — quickly developed: the mafia. Or, to be more accurate, the mafias, since three distinct criminal societies emerged in Southern Italy: the Cosa Nostra in Sicily, the ‘ndrangheta in Calabria and the camorra in and around Naples. All three mafias grew and flourished thanks to, rather than in spite of, the unification of Italy. Where the old, authoritarian southern regime of the Kingdom of the Two Sicilies had commanded some local loyalty and had no legal restraints on its efforts to maintain order, the new constitutional monarchy with its elected parliament and local and provincial offices, was fertile soil for criminal bosses to act as ward heelers for their more respectable allies in the local landowning and business communities. Note: I read John Dickie's Cosa Nostra: A History of the Sicilian Mafia and I thought it was an interesting and informative book. I look forward to reading Blood Brotherhoods.